Winter arrived with full force last Friday. Within two hours the lake, frothy from white capped waves was frozen over and snow drifts began to accumulate. Soon a fluffy, white blanket covered the neighborhood and we didn’t see the sun till Sunday. This is the time when I don’t leave my studio often. I finally found the energy to unpack the last trunk show duffel bag, workshop supplies and banished the killer dust bunnies from the floor. It is also the time I begin to reflect on the year. I have had this blog for just over eleven months. I don’t really count the 2.5 years I had a blog directly linked to my website – few comments and hits made that my practice run… I launched this blog at the beginning of December 2011 and when I opened the statistics page this morning the counter had an exciting number to share. A few minutes ago it sat at 33,333 – a number I never reached with my website till it was up for three years! My conclusion: Blogging works – for me it is ideal! I can share information whether I am on the road dashing from one teaching venue to another, I explore the world to capture great imagery, or I am home and working from the studio. I made a commitment nearly a year ago to post three times a week, and I have kept this promise to myself, you, the reader and the occasional visitor. I might not have been so diligent if I had not seen the counter go up steadily. March 11th, 2012 I reached an all-time high in one day: 929 hits! That was an amazing number for me, the rest of the posts reach anywhere from 50 to 200 hits per day, depending on the topic and who might be interested in what I have to share. Based on these statistics I have made a commitment to continue blogging. At this time I am not sure if the three times per week schedule will continue. So, here is a little encouragement to share your expectations: Weigh in with a “like” and/or a short comment between today and December 6th (the first anniversary of this blog! ), sign up as a follower and I will enter you into a draw. I currently have 233 steadfast supporters and I would like to see this number rise a little before the anniversary date. 13 Nov	This entry was published on November 13, 2012 at 9:09 am. It’s filed under Creativity Update, Journaling, Landscape photography, Special event and tagged blogging, followers, reflecting, statistics, studio time, win a prize. Bookmark the permalink. Follow any comments here with the RSS feed for this post. Thanks, Brenda! Keep checking back! I am out almost daily capturing snow and ice right now. I can’t figure out how to follow on my iPad so I will comment. Although I am not a quilter, I wet felt, knit and dye, I really enjoy checking in on your blog. You have lots of great pictures and I really liked the design post. Please keep blogging! Thanks for taking the time to comment, Pat! So glad that I have something of interest for someone who is not a quilter. I come from a spinning, felting and knitting background – I did not introduce quilting techniques into my work till 2002. Seeing your blog entries in my email list always adds a nice spark to the day! Keep up the nice work Anna. Thanks, Ginger!!! Did you take in QBL this summer? Leona, you are such a wise woman and I am so fortunate to know you! I am also glad you embrace technology – too many women have turned their backs and refuse “to join the party because they are hoping the party will go away”… I just had someone tell me this today! Well folks – the internet is here to stay – as long as we have electricity, we can use the internet and stay in touch across the world! Anna, thanks for your wonderful blog posts. I particularly enjoyed the recent series on Design Principles, and your great photos, too. Amy, there will be more design posts in the new year as I prepare for the two design classes I teach from my studio. Stay tuned!!! Hi Anna, I’m really enjoying your blog and the great photos – but the wintery scene yesterday made me shiver. Hope the snow doesn’t come to Eastern Ontario until Christmas Eve! Oh Bev, for me it is mind over matter. 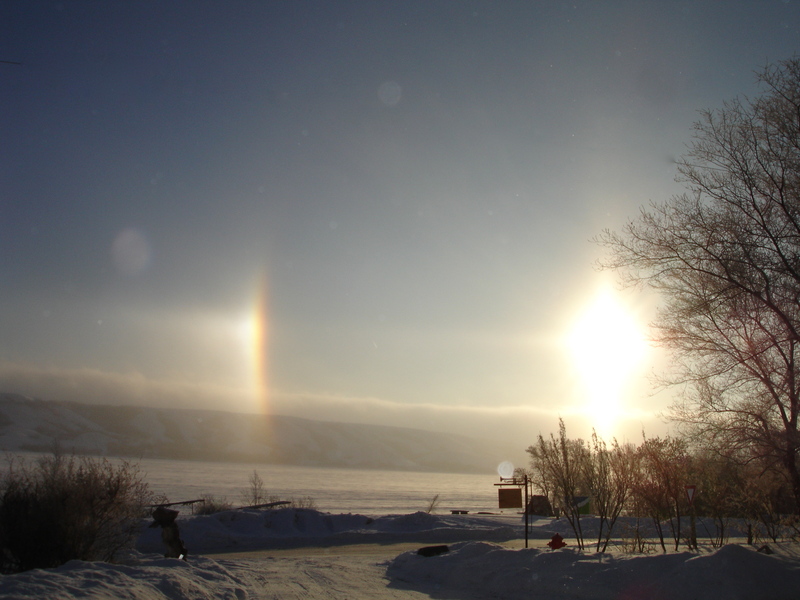 I don’t like winter and the cold either but… I LOVE what it does to my surroundings, sun dogs and all! Thanks for weighing in with a comment. So good to see you are staying in touch after the great class in Prescott. Diane, you are so very welcome – the thank you goes right back to you for really talking up your Kantha workshop experience during both show-and-tell opportunities! Looking forward to seeing you again soon! Keep up the great blogs I enjoy every one, you are a true inspiration to fibre artists. Thanks, Janet! I will try my very best! Anna – your blog is one that I follow regularly, although it took me a little while to hook up with the blog after being used to the newsletter. Thanks for all your inspiration, and for publicly sharing your life as a working artist. I may not comment a lot but I never miss a blog posting Anna! They are full of wonderful ideas, photos, and wisdom. I don’t know how you find the time to do it but we are very fortunate that you do. Linda, thank you for sharing! When I published my newsletter I would receive many feedback comments via email – with the blog these are less regular. However, I do know that the followers and regular readers appreciate the content. My workshops are most often fully subscribed and I attribute this to regular updates on my blog. What a lot of great comments! Well, you did ask. I save a lot of your blogs – creativity, workshop practice, wow photos. It is like dropping into your studio which wouldn’t be easy from Devon, UK. Shirley, your feedback is much appreciated… and do keep dropping into my studio anytime!!! Anna, I look forward to reading your blog each week. Your willingness to share your knowledge is a credit to you and a wonderful benefit for us. Love the photos! Jackie, how wonderful to see you commenting! Thanks for taking the time to let me know that you are a loyal follower! Hello Anna, love your daily news,Today’s picture would have enjoyed so much by Ted, my late husband. Nelly, so good to see that you are weighing in with a comment! Oh yes, with the snow come all sorts of wonderful things… for example an amazing Aurora Borealis display last night… which I captured on camera for the very first time. I will be posting a sampling on Sunday! I agree with Katina! I have really started to look at the beginning of possibilities after a quilt top is done…….what else can I do with this? Thanks for all the inspiration and push I needed! Christa, you are welcome for the “push” – it was a very gentle one… as you are already a person who considers various options! It was great to meet you in Weyburn! What a fantastic group we had! Anna it is lovely to read that you will be continuing with your blog. I seldom comment yet read every post; your photos are stellar and the text of your posts is stimulating and informational, pure delight for me. What a treat that you are hosting a giveaway. Kristin, I am so pleased to see the wonderful responses to my invitation to comment. This deserves a special giveaway! Make sure to check in again tomorrow to see what I am sharing. I have really enjoyed your pictures along with the inspiration they provide, Anna. I am glad you plan to continue sharing your ideas with us in your blog. I am amazed you find time to do so much sharing, but am glad to be able to learn from your experiences. Barbara, thank you for the lovely feedback. I am truly amazed how many people have weighed in with this one short post! This gives me the encouragement to carry on researching and sharing! As a newbie quilter, I enjoy your thoughts on the creative/design process. When I’m ready to try art quilting, I’d love to take one of your classes. In the meantime, your blog gives me lots of inspiration. Leslie, good to hear you find this blog helpful in your quilting journey. Art quilting requires traditional knowledge and techniques – everything I do and teach is steeped in tradition… I just add a little twist here and there. Hi Anna, I enjoy the variety of topics you post on your blog. I get to do some arm chair travel, learn things about art, be inspired by your photos and just have a bit of fun. The variety is what keeps me interested. Jaynie, good to hear that you like the variety. That is what keeps me going as well. I never set out for this to be a repeat of what can be found in books. What you see here is what I love and do! Thanks so much for commenting! Yeah, Bonnie! Nothing like a snow day to get “stuck” in the studio! Thanks for leaving a comment today! always worth a read…and your series on the elements of design etc…one of the best I’ve read….I have saved it for future reference !!! Thanks, Bev! Yes, I have had a number of very enthusiastic emails about the design series I published last month. Well worth the hours I invested in organizing my thoughts and images! I enjoy your blog immensely and have given your blog site to all my art group. I appreciate your insights in art quilting and your photographs are not to be missed. So please keep blogging – I would totally understand if you had to cut it down to once or twice a week! I simply can’t fathom just how much you seem to accomplish! Thank you so much, Karen! Your continued support means a lot, and through sharing we grow! I agree with the rest: you offer so much information along with sharing your personal art journey. And, I might add, you were a huge help to me, personally, when I needed guidance concerning my own teaching experience. You are welcome, DiannaJessie!!! It is great to have follow all across the “big pond”. The compliments can be returned – I equally enjoy your blog and follow it faithfully! I always look forward to your blogs, Anna. I read everyone of them from start to finish. I also enjoy your photos. Thank you for all the sharing you do on the blog. You are welcome, Susan! Good to hear that the images and the posts are still of interest to you and so many others. Yours is one of the few blogs I actually follow and my dream is to take one of your classes next year. You have a formidable talent, backed by a great intellect and amazing organizational skills. You have taught me much already just by sheer example. Thank you for sharing so much with us. Wow Marilyn… this is a huge compliment. I also hope we can connect in the future – if not in a class, watch out to where my travels take me. Maybe we can share a cup of tea somewhere! Anna, I love your blogs. So interesting, informative. Your photos are awesome. I hope you will continue at least once or twice a week. Ann, I will continue! I always worry about not providing enough content or information. Sometimes I wonder if people are interested in just the photo slideshow… but with today’s comments I will worry no more! Hello Anna- I often “save” your site for a time when I have more energy and appreciation of your thoughtful posts and great pictures. You seem to have a boundless depth of creativity and energy to express it. You are an amazing artist. Shelley – that is so GREAT!!! Thanks for the compliments. I love to share and inspire – and at the same time receiving feedback is an inspiration to me to continue. Linda, it appears that the blog inspires you and so many others who are weighing in with comments today. I will take this as a sign to continue on my path! It helps me with staying organized and motivated. Thank you for taking the time to contribute with feedback. I enjoy your thoughts on the blog. They are often transferable to other things I’m doing and give me the courage to try. I’m so glad you came to Victoria those many years ago, and that it put me in touch with such a strong and creative woman. Joan, it so good to read that you are following my creative endeavors since 2006!!! Great feedback – thank you! Hi Anna! I read your blog as inspiration and, recently, a learning tool before I am immersed in your Introduction to Design course coming up in January. That’s great, Kathleen! January will be here soon enough. You are an inspiration with each and every post……your blog is full of information, insights and photos and I look forward to them whenever you can fit them into your busy days. Thanks for taking the time to provide feedback, Vivian! You know I really enjoy your blog. The design lessons were great, and I always love seeing your images! Yes, Alice… I DO know you are a loyal follower and I appreciate your support across the miles. It always makes my day to hear from you! Anna, your blog has been wonderful and your pictures professional. Can’t wait to see what is in store for the new year. Keep up the wonderful work! Thanks for the encouragement to carry on, Roberta! We shall see where the blog takes us… I am committed to continue! Thank you, Alison! Great to know that my blog is the special feature for your coffee break. I love to hear from everyone when and how they benefit from my posts. Blogs are great – just as long as it doesn’t drain your energy from your more creative work. You are a superb artist. Truth be told: I find much inspiration in the blog myself. It helps me stay focused and committed – a realization I experienced almost immediately after switching to the WordPress site. Looks like my efforts are worthwhile! Love the blog…. Read it all the time to stay tuned in! That is so great, Theresa!!! Even if we don’t live “just around the corner” planning Artisan Fairs this is our best way to stay connected… besides the occasional Skype call. I really treasure your support. Anna you are an inspiration to us all. Thanks for the blogs and I love your photograpghy. Hi Anna… Your blog is just what I need in the mornings as you post. Certainly the content is always informative and your knowledge andskills base are so valuable to each of us as a resource. The sharing of the design issues is invaluable and always, the slideshow is terrific. THANK YOU for the time, the commitment and the inspiration…. always in awe! Bethany – no need to be in awe… I appreciate the feedback and continued support. Makes the long hours (sometimes) preparing a post all worthwhile! Hi Anna, I am reading your past blogs this afternoon and want you to know how much I enjoy your entries. The photos are heavenly inspiration. You are always inspiring. Gillian, thanks for your continued support and taking the time to comment. I look forward to your blog and have learned so much about art. Things I never thought about when putting a quilt together. I’m beginning to look at the pieces of fabric from a whole new perspective. Thank you for taking the time from your busy schedule to enlighten us. Also, from someone who has left the prairies behind, thanks for sharing the pictures that remind me of home. Your blog is always one of the first emails I open. Thanks for all the valuable information and the beautiful pictures. Dot, thank you so much for this feedback! It really makes my day and gives me the encouragement to continue on my blogging path! Katina, you are such a loyal follower and I appreciate your sharing how valuable the blog is for you. Teaching and sharing has been an active part of my life – from my days training in Munich in the 1970s to this day I try to identify something each day worthwhile sharing. I am glad you are enjoying the prairie imagery – after my trips east this years it feels good to walk about and gather new images closer to home.